As I’ve mentioned before in reference to the Fremont culture of what is now Utah, while the Anasazi of the Four Corners region are by far the most famous of the prehistoric southwestern societies, and particularly famous for their allegedly mysterious disappearance, there’s actually very little mystery about what happened to them. They very obviously became the modern Pueblos of New Mexico and Arizona. It has not been possible so far to trace connections between any specific prehistoric site and any specific modern pueblo (beyond obvious cases like the Zuni and Hopi pueblos that were abandoned in very late prehistory or very early historic times when the inhabitants moved to nearby communities that are still extant today). 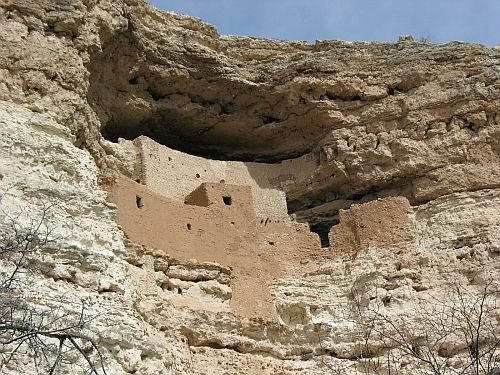 However, the general connections between the Anasazi and the modern Pueblos in material culture are quite clear and no one disputes them. When it comes to the other prehistoric cultures, however, the situation is much less clear. While a few seem to have clear modern descendants, most show few if any obvious similarities to the modern indigenous cultures inhabiting their areas, and the extent of any continuity is controversial at best. A recent comment on my Fremont post mentioning the Gallina culture of north-central New Mexico reminded me of this. I may expand on some of these cultures in future posts, but for now I just want to list them so that people who are not familiar with the diversity of southwestern culture history get a sense for the range of cultures known from the archaeological record and the very limited extent to which it is correlated with the equally extensive ethnographic record of this region. Before I get to the list, though, I should give a brief introduction to the “root-and-branch” system of southwestern archaeological taxonomy, which is necessary to understand what these archaeological units are and are not. This system was originally developed by Harold Gladwin, a New York stockbroker who moved to Globe, Arizona in the 1920s and established a nonprofit archaeological research institute known as Gila Pueblo that was immensely influential in the development of southwestern archaeology in the 1930s and 1940s. Gladwin’s conception of southwestern culture history was based on an analogy to trees, with “roots” as the basic units, which in turn were divided hierarchically into “stems” and “branches.” The data on which these units were based was mainly ceramic, as pottery is the most useful artifact class for distinguishing among the various cultural manifestations of the prehistoric Southwest. The “branches” were considered roughly equivalent to the “tribes” of the ethnographic record, but given the historical focus of archaeology at this time they were further divided into chronological “phases.” Gladwin’s scheme was revised by Harold Colton of the Museum of Northern Arizona in Flagstaff, who renamed some of the roots to avoid Gladwin’s association of them with specific modern linguistic groups, given the uncertainty involved in this kind of identification. Colton also generally downplayed Gladwin’s intermediate “stems” in favor of a simpler system of “roots” and “branches” (which he still analogized to modern tribes). The system that emerged from this interplay of Gladwin’s and Colton’s ideas has remained in use ever since as the main taxonomic scheme for southwestern archaeology. Within this system, “Anasazi” refers to one of the roots, with “Chaco,” “Mesa Verde,” Kayenta,” etc. as branches. Note that I have avoided using the term “Ancestral Puebloan” in place of “Anasazi” in this post so far; there’s a reason for that. While the term “Anasazi” has been criticized based on its Navajo etymology, it refers to a very specific unit in a taxonomic system, and “Ancestral Puebloan” is a problematic replacement because most or all of the other units in that system are also likely ancestral to the modern Pueblos. For want of a better term, then, I’m sticking with “Anasazi” for this purpose. With that prologue out of the way, below are the roots and branches currently recognized by most archaeologists that don’t have obvious modern descendants. Note that while the Chaco, Mesa Verde, Kayenta, and Rio Grande branches of the Anasazi root are not listed here since they are clearly ancestral to the modern Pueblos, some other Anasazi branches are included since it is much less obvious what happened to them. They may have ended up as part of one or more modern Pueblo groups, but it is also possible that they changed their culture so much as to become unrecognizable archaeologically, or died out altogether. The branches belonging to other roots may have contributed to the formation of the modern Pueblos as well, or they may have developed into other cultures or disappeared entirely as well. Gallina Branch: Inhabited north-central New Mexico until about AD 1300. Late Gallina sites exhibit extensive evidence of violent death, implying conflict with other groups, perhaps those entering the area from the north and west around this time. While the Gallina are generally considered a branch of the Anasazi, their material culture shows many similarities to Plains groups to the east and their actual ethnic and linguistic affiliation remain unclear. Virgin Branch: Inhabited the Virgin River valley and adjacent areas of southern Nevada, southwestern Utah and northwestern Arizona from Basketmaker times until approximately AD 1150 (or possibly a bit later). They seem to have been part of the overall Anasazi culture area from early on, but the Virgin region was abandoned significantly earlier than other Anasazi areas further east, and it is unclear what this means. Fremont Root: Inhabited most of modern Utah for centuries until fading away in the late prehistoric period. The relationship of the Fremont to modern Pueblo and Numic populations remains unclear, and it is also unclear just how coherent a cultural unit “Fremont” ever was. Hohokam Root: Inhabited southern and central Arizona (below the Mogollon Rim) for millennia from the initial development of agriculture until the fifteenth century AD. Famous for their elaborate canal systems and distinctive pottery, as well as their apparently Mesoamerican-influenced ballcourts, the Hohokam remain one of the most mysterious of prehistoric southwestern cultures despite also being one of the best-studied. They may have been ancestral to the modern O’odham (Pima and Papago) peoples who inhabited the same area in historic times, but this is hotly disputed as there are many differences in material culture. There have also been suggestions that some Hohokam may have been ancestral to modern Pueblo groups (especially the western Pueblos of Hopi and Zuni) and Yuman-speaking groups west of the Hohokam heartland. Jornada Branch: Occupied south-central New Mexico until about AD 1400. Possibly descended in part from the Mimbres to the west and possibly ancestral to some of the Rio Grande Pueblos further north, the Jornada are among the less studied southwestern groups. Based on rock art, they have been proposed as the originators of the kachina cult that later became widespread among the Pueblos. Mimbres Branch: One of the most talked-about, but not one of the most-studied, groups of the prehistoric Southwest, the Mimbres are known mainly for their unique pottery featuring naturalistic decoration. This area showed a long developmental sequence under apparent Hohokam influence followed by a brief period of possible (but disputed) Anasazi influence including aggregation into large, nucleated villages, followed by regional abandonment in the twelfth century AD. Mountain Branches: There are several branches of the Mogollon proposed to have existed in the mountains of western New Mexico and eastern Arizona until around AD 1400 when this whole region was abandoned. There are many continuities between these settlements (which often took the form of large aggregated pueblos) and modern Hopi and Zuni, but the connection is not totally unambiguous. Patayan Root: By far the least studied of any of the southwestern roots, the Patayan occupied the harsh deserts of western Arizona and are generally considered to be ancestral to the modern Yuman-speaking tribes of that area. (Gladwin even called the root “Yuman,” which Colton changed to “Patayan” to avoid relating it quite so obviously to a modern ethnolinguistic group.) Despite the fairly straightforward relationship of at least some Patayan branches to modern Yuman groups, the root as a whole remains poorly understood, and the northern branches in northwestern Arizona (especially the Cohonina and Prescott branches) have seen very little research and their attachment to the root at all has been challenged by some archaeologists. Sinagua Root: This group, occupying the area around modern Flagstaff, Arizona, shows clear evidence of influence from both the Kayenta Anasazi to the east and the Hohokam to the south (and possibly the Cohonina to the west as well). It is not at all clear that they form their own root, but if they don’t it’s equally unclear which root they belong to. This may be more a flaw of the classification system than a real mystery about the people. Whether they belong on my list is dubious as well, as they are probably ancestral to certain Hopi “clans.” Still, enough doubt remains about their origins and fate that I thought it was worth mentioning them. There are other groups as mysterious as these, including some whose very existence as cultural units is controversial (most notably the Salado of southeastern Arizona and adjacent areas). This list should give a general sense, however, of how much diversity there was in the prehistoric southwest and how little we know about the relationships among the various groups and their relationships to modern tribes. In this context, the Anasazi of the Four Corners don’t look particularly mysterious, and I suspect the unusual attention paid to them stems mostly from the picturesque nature of the remains they left behind, which certainly does distinguish them from most (though not all) of the other groups, which left less impressive architecture behind.